Precision Cleaning, Chem Clean, Cleanroom Packaging, Class 100 Cleaning - Clean Sciences Inc. Stainless Steel: 300 series, 400 series, Kovar, Inconel, Precipitation Hardening 17-4-PH, 17-7-PH, 18-8-PH, etc. Ceramics: Quartz/Silica, Glass, Alumina, etc. Plastics: Teflon, Polycarbonate, Viton, PTFE, Peek, Torlon, Kevlar, etc. 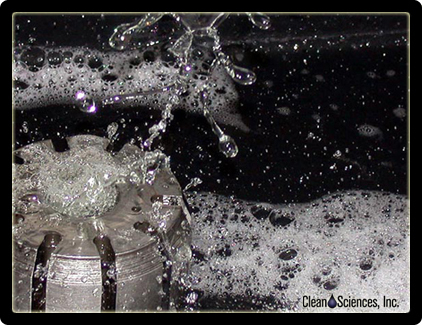 Degreasing ± Ultrasonics: Variety of soluble surfactant chemistry - Anionic, Cationic, Non-Ionic. Passivation: Nitric acid and Proprietary Chemistry. Stripping: Custom designed chemistry - Preferential deposit removal from materials and parts. Organic: Oil, Grease, and Cutting Fluids. Inorganic Solids: Metals, Oxides and Scales, Salts, Hydroxides and Carbonates. Inorganic Ions: Na+, K+, Cl-, F-, NO-3 , etc. Magnetic Materials: Disks and Drives. Particulates: Sub-micron sized, dust, etc. • Door to Door pick-up and delivery with 24-Hour turn around available. • Gross contaminate removal (GCR) and particulate removal. • 1000 square feet of Class 1000 clean room. • Ultrasonic and Mega Sonic Equipment. • Solvents and soluble surfactants for aqueous and non-aqueous processes. • Oven bake out at variable temperatures and time requirements by forced air or vacuum equipped ovens. • Class 100 Packaging wipes, UHV foil, poly or nylon clean room rated bags custom made in assorted sizes. • Assembly capabilities in a controlled clean room environment. • Shopkeeper tracking software with paperless traveler system with part photo’s & instructions for cleaning, quality and packaging. Engineering staff available to customize your cleaning process and develop procedures. Consulting and Research & Development services available. Courteous Staff geared to meet or exceed each customer's quality and schedule requirements.